is just below here. Scroll down if you need to, and enjoy the first couple of chapters. TPC began my first series. It includes such sequels as The Nightmare Catcher, and The Cosmic Kid Catcher. On that singular night in The Dalles, Oregon, a light shone in the window of nine-year-old Haley Madsen’s darkened room. It flared quickly across the opposite wall, and disappeared as a car sped down the street, directing its headlights elsewhere. In that fleeting glow, her dark-skinned face lit up for a moment, framed by her curly black hair. Her obsidian-colored eyes remained closed, but were attentive to the brightness, even as she continued to dream. Haley was a rare, lucid dreamer, since hers were lifelike and filled with the knowledge that she was dreaming. In fact, experts said hers went far beyond lucidity. Even Mr. Bridger had told Haley her ability to inhabit several lucid dreams at once while maintaining consciousness in her physical body was almost unheard of. That ability allowed her to monitor whatever occurred in her bedroom, even as she slept soundly, and dreamt multiple lucid dreams. Haley’s attention, however was attracted by a scream that summoned her to the nightmare she’d been most focused upon before the interruption. She zoomed across the dreamscape of The Dalles, and swooped like a bird of prey into the bedroom belonging to a horrified girl. Haley’s dream-body slowed, and glided close to the panicked seven-year-old sitting on her dream-bed. The imaginary covers were pulled around the little redhead’s neck, and Haley was surprised the child hadn’t hidden those striking, blue eyes. Instead, despite her terror, she squinted as a dark serpent moved closer. The girl’s physical body lay a few feet below the dream that Haley witnessed. The real bedcovers had become wrapped around arms and legs, trapping the child. Close by on her nightstand were two movies—the animated film Brave, and an old video about a giant anaconda. The twisting black shape rose high above the foot of the dream-bed, as if attracted by the frightened voice, and the snake’s awful head grew larger than the girl’s entire body. It came at her dreaming self with menacing jaws parted, revealing long fangs as it surged from side-to-side, sliding ever closer. Sometimes Haley helped dreamers by battling such monsters directly—fighting them on the dreamer’s behalf even though it was their nightmare. But Haley decided to give the girl a chance to strengthen her natural abilities. Time was a major concern because the child’s parents—especially her mother—had begun to awaken due to the screams. But if the family interfered too soon, it would result in a setback for their daughter. Haley had to work quickly. Erica blinked, which told Haley she’d heard the question, but she continued staring at the serpent as though mesmerized by its eyes, and didn’t say anything. Erica’s bright blue eyes blinked again, and this time she nodded slightly. The enormous snake paused, and its head slowly turned toward Haley, who didn’t want to assist the girl directly. Erica needed to accomplish it by herself. Therefore, Haley floated her dream-body behind the redhead, causing the serpent to turn back toward Erica. Erica tried to turn her head and look at Haley. The idea of biting the snake had gotten her attention. She’d never thought of that and was absorbed by the idea. Erica’s body tensed as she tried to decide what she should do. Then, with a snarl, she threw her blanket over the reptile’s head, and launched her dream-body forward. Her small arms and legs clamped around the serpent’s neck, and she opened her mouth wide to bite where its neck entered the blanket. Haley thought the fabric concealing the snake's terrible teeth and eyes helped a lot. The surprising part came next, as Erica’s jaws enlarged like a reptile’s, so that when she bit the serpent, her teeth were huge fangs. That big old snake flopped all around, trying to loosen the girl’s deadly grip, but gradually it weakened until finally the monster serpent dropped on the bed, and lay still. Erica released her hold, and her mouthparts became normal-sized again. As the two girls stared at the snake, it shriveled into a miniature gummy worm. With a little laugh, Erica picked the thing up and popped it into her mouth. “Okay,” Erica said, just as a monstrous black shape filled half of her bedroom. Erica didn’t say anything because the spider was moving closer to the bed. Its front legs thumped across the floor as it came, and the eight miniature eyeballs glowed in the dark. The reptile’s head rose out of the shadows, blacker than anything else in the room—darker even than Haley’s hair. It slithered over until it was between Erica’s bed and the spider, which quickly moved backwards on those eight hairy legs. As if the giant tarantula understood those words, it crowded against the back wall, trying to make more space between it and the big reptile. “Kill the spider, now,” Erica said. The snake grew even larger, until it seemed the bedroom could not contain it, but its coils stayed away from Erica. Instead, they wound about the spider, totally surrounding it. The arachnid’s tiny eyes peeked out and glowed with fear. Its legs flailed against the mighty coils, but it was helpless as the snake squeezed the life from its body. Those many eyes turned dark, like a light switch had been flipped off. Haley almost felt sorry for the spider when it shuddered for the last time, and the snake swallowed it in one big bite. Right then, a warning called Haley from one of her other dreams. She was needed elsewhere. Even as Haley said that, the large spider lump in the snake’s neck moved farther down inside its long body. For a second, Haley thought Erica was talking to her, but then she realized the truth when the snake disappeared, and Haley chuckled, and told Erica, “With practice, you can become like me, a dream superhero, and help other people in their nightmares.” But Haley couldn’t talk more about it right then. Instead, she transformed into her original version of Dreams-Girl—taking the shape of her slightly bigger, and older self. Haley was instantly dressed in her flashy, red and yellow outfit. The one without a cape. Erica’s mouth opened, but she couldn’t say anything. She simply stared at the costumed superhero. “See you later,” Haley called as she streaked through dreamtime space on her next mission, with her ponytail and red hair-tie flapping in the cosmic dream-wind. Dreams-Girl Haley arrived in the next dreamscape, and knew things were more serious than her visit to Erica's nightmare.When she entered the new dream, one of her regular dreaming selves was already there. All the versions of Haley’s dreaming selves kept a closely guarded secret. They had discovered that most authentic vampires were not the fanged, bloodsuckers in a physical body that everybody thought of. They were actually wispy shapes, which snuck about in people’s dreams, and then fastened themselves onto a human’s energy body to drain off as much life force as they could before their victim awoke. They were actually the dreaming bodies of humans, who seldom knew about their own nightly nastiness. They were subconscious dream foragers. Also, the humans who were psychically drained never knew about their nocturnal parasites. The only thing the victims noticed upon awakening was feeling weak and yucky. There was a lot more to it, of course, and as Dreams-Girl Haley concentrated on the shadowy form snuggled beside the sleeping body of a teenage boy, she knew she’d stumbled onto something really dreadful. It was what her higher self called an upper echelon, dream parasite. Few occurrences scared any version of Haley in dreams, but she knew instantly to be particularly careful with that noxious creature. Not only was the nearby dark form a deadly enemy, but if she startled it and the shadowy figure fled too quickly, the teenager’s energy would gush out, and that could be very bad. “Sing,” Dreams-Girl Haley told her regular dreaming self. All their dream versions belonged to one physical body, the one called Haley, but they also had their own individual natures, each at a different level. It was complicated. They had their separate thoughts, plus they generally knew what all the rest were thinking about and doing, as well. The regular dreaming version of Haley began to sing a rhyming tune, but she also crouched down, and remained at a distance from the sleeping boy. She intended to stay clear of that disgusting nocturnal leech beside him. Her objective was to gradually gain the vampire’s attention, but not to frighten it off. The creepy thing was so deep into feeding that it had not noticed Haley’s two dreaming selves were nearby. Her Dreams-Girl consciousness stood at a greater distance from the singing version, and attempted to assess the situation. It wasn’t long before she had a strong premonition they had stumbled onto a foe more dangerous than any seen before. Most nighttime human parasites did their leeching unconsciously, but this was a rare form that was knowingly active. In addition, its physical body’s conscious mind was a human sapper during the daytime. Therefore, it was draining the teens’ energy off both night and day. Even when a Night-Sapper, as Haley called them, practiced their tricks in the day, they tended to be opportunists, draining whoever was nearby and susceptible, but then they moved on to the next victim. However, the human leech Haley had just discovered utilized any chance to sap that one particular teen. Haley found out by tuning in on the boy’s mind that the daytime sapper’s favorite method was to use phone conversations to drain energy from its victim. Those calls dragged on-and-on about boring trivialities, so that by the time they ended, the boy felt exhausted and also sometimes despondent. As Haley’s understanding of that sick relationship grew, she noticed the wispy energy robber was changing form. It had originally appeared as a shadow beside the youth, but now it lightened and took on color, and its shape became more solid and defined, with identifiable, female characteristics. Of course, that wasn’t necessarily what the human creating that dream-form looked like. It could be male or female, a human—or something different. The Night-Sapper was also an accomplished shapeshifter, and it was transforming in an attempt to appear in a figure it felt would lull away Haley’s concerns. Typical nocturnal vampires were elusive, and flew away when discovered, but the current one intended to entice a second victim in addition to the teenage boy. It meant to siphon off all Haley’s energy, as well. In moments, the form was easily recognizable, and appeared to be in the shape of Haley’s guardian, her Aunt Fran. Dreams-Girl worried she might be outclassed, and mentally called on her powerful mentor—a more advanced variation of Haley’s dreaming bodies, and they instantly traded places. 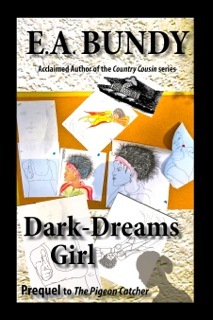 In front of Aunt Fran’s phony double, Dark-Dreams Girl suddenly appeared. She was an imposing teenage female, dressed in her red-and-yellow superhero costume, replete with a long, flowing, red cape. She was a more formidable version of Haley’s higher dreaming self, particularly as her cape seemed to shift in the wind—although there wasn’t even a mild breeze. Her red headband couldn’t fully contain her unruly hair, which appeared alive, with twisting curls, as if tiny writhing snakes poked out in all directions. Her dream-self’s skin was every bit as dark as Haley’s, and no matter how she tried to prevent it, one of her elf-shaped, pointed ears always poked out through her black hair. Unlike the less-developed dream-body of the Haley who had summoned Dark-Dreams Girl, this one was a veteran of so many hard-won nightmare battles that she blazed with power and confidence. And although Haley was merely nine years of age, the current aspect of her psyche had a more mature female figure like that of a seventeen-year-old. Her experiences in the psychic realms went beyond Haley’s, although when the smaller girl tried hard, much of Dark-Dreams Girl’s awareness was available to her—and the other way round. As Haley’s regular dreaming self departed, the figure of Aunt Fran rose to greet Dark-Dreams Girl. The woman’s broad smile and open gestures were disarming, and superhero Haley allowed her to approach closely before she raised her right hand in a signal to halt. When the creature was that near, even without direct touch, the vile Night-Sapper somehow projected a convincing feeling of caring. Her loving emotions flowed freely, completely embracing Dark-Dreams Girl. “I have so wanted to meet you,” the false Fran-woman-thing said, “because you mean so much to Haley…and to me.” Her hands reached out beseechingly, and attempted to grasp Dark-Dreams Girl’s outstretched arm. Her sapping energy became unbelievably potent, and was nearly impossible to counteract. It was alluring in the same way that strong family ties cement people together, even if those ties are extremely negative ones. And, accompanying that energy were projected feelings of guilt, ready to heap upon Dark-Dreams Girl should Haley’s core being consider rejecting those warm emanations. Dark-Dreams Girl dropped to one knee, and it was not an act. She was struggling, and she knew her anguish showed on her face. “Aunt Fran?” she asked. “Yes, Dear,” the impostor replied. Forcing herself to rise, Dark-Dreams Girl moved forward, and threw her arms around the phony Fran in a welcoming gesture. “Of course I recognize you,” the superhero said. In that same instant, she broadcast her own love energy so strongly that the fake Fran staggered. “Wait!” cried the pseudo-woman. “You must not….” But the damage was done. Too late, the Night-Sapper realized the trap she had laid for Dark-Dreams Girl had backfired. She flung about, trying to break free, but Dark-Dreams Girl’s arms held her tight, and the vitality radiated in ever-growing waves, causing the energy-sucking vampire’s projected body to virtually become a dying wraith. “No! Please,” she begged, but Dark-Dreams Girl’s energy continued to increase, dissolving the other’s very center. That result occurred because pure love energy, freely given, was a poison to her, or him, or whatever the sapper really was. Dark-Dreams Girl called out, “Awaken,” to the teenage boy still lying fast asleep on his bed. She wanted him to witness what had been happening while the vile projection was still visible. His dream head rose up, and gazed at what was left of the Night-Sapper. The lad did as she suggested, and the dwindling wraith ceased its struggle, taking on a new appearance known all too well by the youth. In that moment, he discerned the evil that had been perpetrated against him, and recognized its source. The Night-Sapper screamed in agony, and dissolved in a puff of smoke. His dreaming head dropped into his sleeping body, and a peaceful smile settled on his face. Dreams-Girl flashed away to carry out the request. Dark-Dreams Girl continued on her mission, leaving her counterpart to wonder where one of them ended—and the other began. The insistent door pounding began again. “Haley!” called Aunt Fran. Haley held her breath. Her curly, black hair barely poked out of the blanket. Rolling onto her back, her face scrunched-up in concentration as she squeezed her eyes tightly shut, pushing back the sleepiness. “Kevin needs you.” Her aunt said. Moaning again, Haley’s cheeks reflected pink and purple highlights from the cartoon-studded bedspread pulled tight against her neck. “Alright….” Haley’s eyes popped open. This better not be a trick. Kevin almost never called for her. What time was it, anyway? She glanced without success, seeking the small Mickey Mouse clock on her nightstand. Sliding the picture of her mother and father to one side, she saw their faces—in contrasting dark and light—peering out from a happier time in Portland. She squinted at the clock’s face, reading the digital numbers: 8:32 A.M.
Haley stood up. She willed herself to get dressed, forcing her thoughts to shift, focusing on Kevin. What could he want? Her mind picked its way through hopeful fantasies as she began to dress. She was only nine; he was sixteen. Still, she hoped they really were friends. While getting dressed, she discarded one foolish thought after another, her mind racing until the final idea hit her—his big soccer game! He should already have left for Portland and the final play-offs. Mostly dressed, Haley paused in front of her wall mirror. She pulled her hair tight to the back of her head, fastening it into the ponytail she always wore. In the reflection she saw her cartoon character pajamas lying in a heap at her feet as she adjusted her jean-fabric shorts. She smiled at the reversed-image of her pink t-shirt’s emblazoned words: Adorable Princess—Not. Entering the kitchen, Haley smelled hotcakes and sausage. She plopped into the chair in front of her plate, leaning forward, sniffing the aroma. A sausage disappeared into her mouth. “Sorry!” Haley said, chewing loudly. Haley studied her hotcakes. If she did an especially good job with his pigeons, maybe Kevin would finally let her in his bedroom. Probably not…but she could hope. It always came back to the fact he was sixteen and she was only nine—but still, he let her hang out with him…sometimes. Probably just because they were neighbors. The next two sausages disappeared as though a giant vacuum had inhaled them. Haley rolled her hotcakes around the last link, and took a large bite as she headed for the door. “Okay!” Haley yelled as the door slammed behind her. It was late in the year for a soccer game but Haley guessed these play-offs should be the last. There’d still be summer leagues but Kevin would be working by then. She’d probably see less of him than she did now. A small, fluffy dog barked joyfully, racing circles around Haley as they made their way from her house through the shared yard, to Kevin’s. She beamed at her little sidekick—then glanced to the right. Mrs. Conner’s car was gone so his mother had already left. Turning back toward her house and not seeing her aunt in the window, Haley tore off a piece of sausage and dropped it into the small waiting mouth. She wasn’t supposed to feed Tiny Terror this way because they said it would make her dog a nuisance and a beggar. Her little mutt scarfed the treat and raced for the neighbor’s. Haley’s scruffy little fluff-ball discovered Kevin’s old, black lab tottering toward them. The small, frenzied pooch ran rings around the older dog, yapping ceaselessly. Molly half-growled, half-barked, in greeting. Haley thought the lab looked ancient with her white muzzle glinting in the morning sunshine. The wagging tail was the most active part of her body. Haley led the two-dog procession around Kevin’s house and over behind the row of unattached garages where he’d built his racing homer loft. As they neared the pigeon’s wire-covered, flying pen, Kevin’s homers could be seen basking in the sun. They lay on their sides, stretching out a single wing, feathers splayed to catch the morning light. The birds barely reacted to the familiar antics of Haley’s barking dog. Pausing to admire the pigeons, Haley heard a car rounding the corner, its glass-pack muffler roaring throatily. She looked up, though she had recognized the sound of the old car owned by Kevin’s friend, Cal. What did he want? She returned to viewing the racing homers Kevin often allowed her to help him feed. “I was suppose ta go with Kevin to the soccer-thing this mornin’….” Cal said. Haley thought he sounded guilty and guessed he hadn’t gotten up in time. Why did he need to explain to her? Haley shrugged. “Don’t like her, neither.” She moved to the door of the pigeon pen. The interior and exterior of the loft were white, making the inside surprisingly cheery, and the one whole end opened onto the wire aviary. The pigeons barely reacted to Haley’s presence but were quite jittery with Cal there. She doubted he’d ever been inside before. “Why’s he got so many?” Cal asked. She replied, “Loses some in races.” She thought he didn’t know much about the birds in spite of being one of Kevin’s closest friends. “How come Carol hates you?” Cal asked. “Complicated, isn’t it?” Haley’s reply seemed to pass by Cal without him registering it. She thought he was none too bright where girls were concerned. Maybe, she reflected, he just wasn’t too bright, period. “Don’t get any feathers for two weeks,” she answered. “That’s because their parents feed them that way.” She went over and checked the grit feeder, thinking the babies were cute. There was plenty of the red mineral grit and the five-gallon water container was over half full. She opened the lid of the steel garbage can where Kevin kept the pigeon feed and removed a full scoop. She whistled to the birds like Kevin always did, and poured the grain into the feed hopper. Pigeons flew in from the aviary and off the loft roosts, scrambling for food. Kevin didn’t usually feed until after their morning flight. She didn’t know if he’d remembered to exercise them or not, but she’d only been told to feed, so that’s all she’d do. Cal backed apprehensively away as though he thought the birds might swarm all over him. He leaned against the door, ready to escape. Haley smiled, feeling secret satisfaction. The pigeons in the flock fought their way to the edge of the feeder to get their share. Some climbed over the backs of others and a few got edged out, having to move to different assault positions. In the melee, grains occasionally got knocked into the air, landing on the floor a few feet distant. Mostly, it was the bigger grains like corn and peas that catapulted out. As the feeding frenzy lessened, Cal stood a short distance from the exit. “Where does Kevin race them?” he asked. By the manner in which he’d asked and the way he looked around, Haley got the idea he thought the birds ran down a track on their legs. She laughed out loud. “The shortest races are like…fifty, or seventy-five miles,” she replied. The perplexed look on Cal’s face caused a greater laugh from Haley and some of the pigeons looked up in alarm, backing momentarily away. “They fly that far,” Haley said. “Up to five-hundred,” she said. “Miles?” he stammered. She nodded. Cal looked over at the birds with new respect. “Haven’t you seen his trophies?” Haley asked. Cal shook his head. “Nobody knows,” she replied. “Instinct, Kevin says.” She didn’t know for sure what instinct was but the answer satisfied Cal. He probably didn’t know its meaning either. 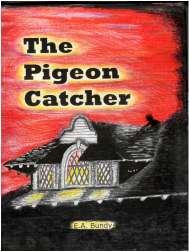 He glanced through the slatted partition wall at some other pigeons. Cal followed Haley back outside. “You know a lot about ‘em,” he said. “Thanks.” she smiled. Maybe Cal wasn’t so bad after all. From what she’d seen of his car, Haley thought not making it to Portland was an understatement. She was surprised it could get clear across town. Thinking about Cal, she decided that away from all his friends he was lonely as she was—only, she was like that all the time. “Well,” Cal said, “I guess I better head home. You probably want to go play with yer little friends…or somethin’.” He sounded reluctant to leave. She didn’t look back at Cal but felt him staring at her. It surprised Haley, telling Cal something she’d never even told Kevin. The main reason she tried so hard to hang out with her neighbor was she didn’t have friends her own age. Haley looked up briefly but turned away as she realized tears were forming in her eyes. She was shocked by her strong reaction to what Cal said. But even Kevin had never stated right out loud he was her friend. She began to stumble away—fighting back tears—finally having voiced what she’d never admitted to anyone but herself. She stood without turning and heard Cal plop onto the ground a few feet away. Haley felt herself slide to the ground. Without looking at Cal, her head nodded agreement. That thought, the way Cal expressed it, made Haley smile. Maybe he wasn’t totally clueless about girls after all. A thunder of high-pitched barking accompanied the fuzzy form of Tiny Terror exiting the dog door at Haley’s house and making a beeline in their direction. Haley thought her pet must have gone back to eat his breakfast. The lovable little monster jumped all over Cal and then Haley. She laughed, rolling around the ground with her pet. Haley reflected Cal had fended the small dog off as best he could. She giggled, imagining the big lug being pursued by a teeny dog. When she had her little munchkin safely tucked in her arms, she looked at the older boy. “Thought I didn’t like you,” she said. “I get that a lot,” he replied. They both laughed, and Molly raised her sleepy head from the grass, but swiftly returned it to snooze-position. “Sounds just like my teachers,” Cal said. “Don’t believe ever’thin’ they tell ya. Look how good I turned out…how many friends I got!” He glanced around as if looking for his absent friends.